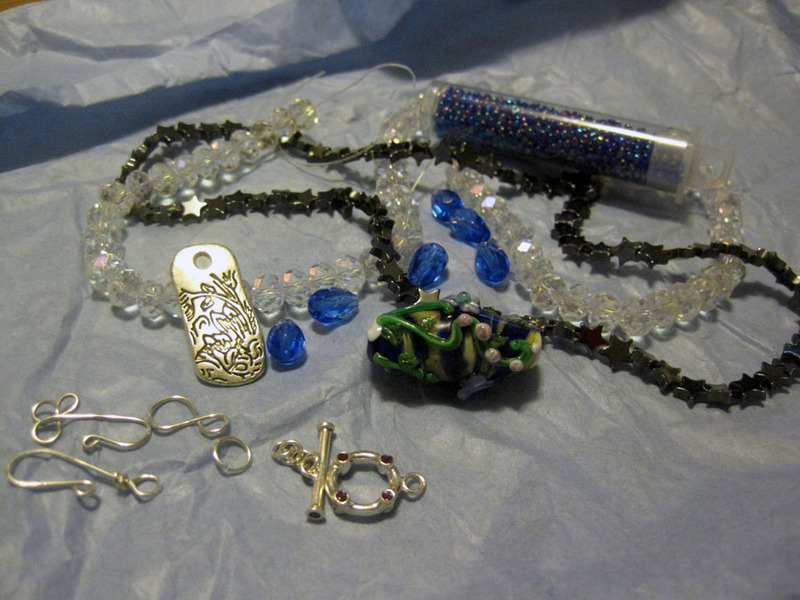 Secret Song Designs: Bead Soup Blog Party Reveal! 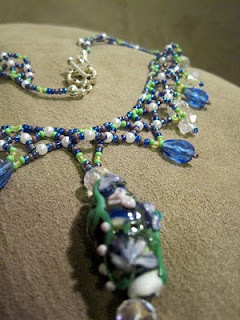 The bead soup at the top came from the very talented Tammy Powley. You can see all of her work at her blog and specifically what she created with what I sent her here. She sent me some great stuff and I tried to incorporate as much of it as I could. I'm looking forward to playing with the pieces I didn't get to use in time for this reveal in the future. There were beaders from five continents who participated in this bead soup party and huge thanks go to Lori Anderson for organizing the event. You can find the whole list of participants and blogs on her website. I'm looking forward to checking out all of them over the next few weeks. I really loved the focal bead that I was sent and the way one of the clasps picked up some of the colors in the multicolored bead. I don't often make really colorful pieces but I really wanted to use the seed beads I was sent plus extra beads from my own collection to capture how multicolored the focal bead was. Oh the focal was fabulous and your necklace was the perfect compliment to it. The colors go so beautifully together, a really lovely piece. So delicate and pretty Wow!!! Nice job making the focal work with your colorful beads! Thanks for including a photo of how the necklace looks worn. It really helps show off your beadweaving skills. What amazing detail! You did such a great job with your mix, I am sure your partner is very pleased with your creation. Oh wow, this is so gorgeous. It really does honor the beautiful focal bead. Great work! Fantastic! Love the networking you did. We’re all being pushed outside our comfort zones — with amazing results! What a fantastic design. Very fun colors too. A really nice statement piece! WOW but that's some transformation! I'm impressed! You did a fantastic job. what beautiful beadweaving! great design and colors! Just stunning! what a great swap! Very nice piece! Love the color scheme! I love the technique you used. Such a great necklace! I really like the focal and colours! Your pieces are simply beautiful! Great work, really!! Wow!! I love the bright colours - you should work in them more often! 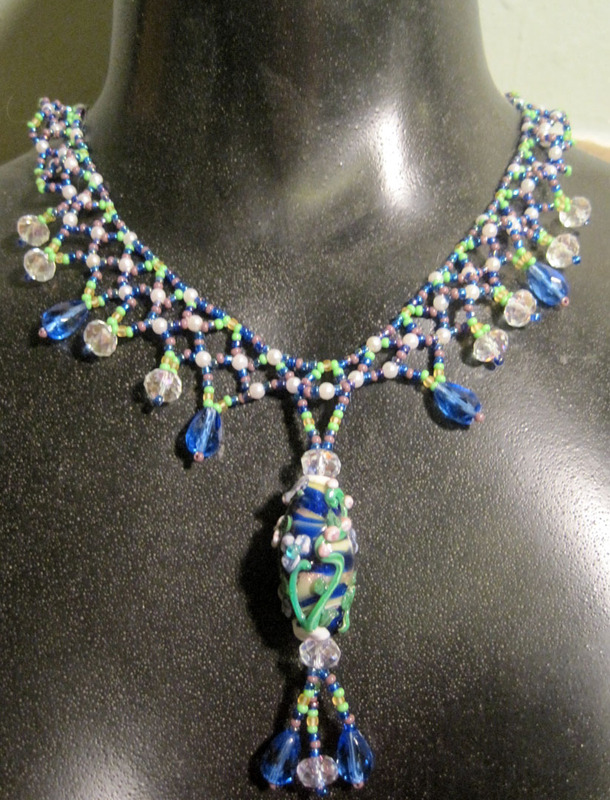 Your beadwork is beautiful as is your design. What you have done enhances the focal perfectly. Some serious skill sets! Gorgeous necklace! יפה!!! צבעים שמחים. כל הכבוד. Beautiful netting - really shows off the focal bead. Juat beautiful, another thing to try to add to my list! lol It is truly amazing seeing all the different beading styles! I am always amazed at how can anyone work with such small beads. I am not into colourful stuff either, but this focal needed just what you gave it. Very pretty necklace that compliments the focal well. Feels like spring, this one. Well done! Very pretty, love the way you worked that focal into your netting. This is so, so pretty - lots of beautiful work here!! My hats off to you w/your design! 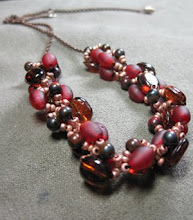 I love the gorgeous necklace you designed around that incredible focal bead! I love how your beadwork mirrors the colorful focal, great work and lovely design. My hats off to you for your beaded netting. Beautiful piece!! Ohhh, so nice, I hadn't seen anything like this yet on the blog hop. The necklace picks up the colors of the focal perfectly~! Beautiful piece! 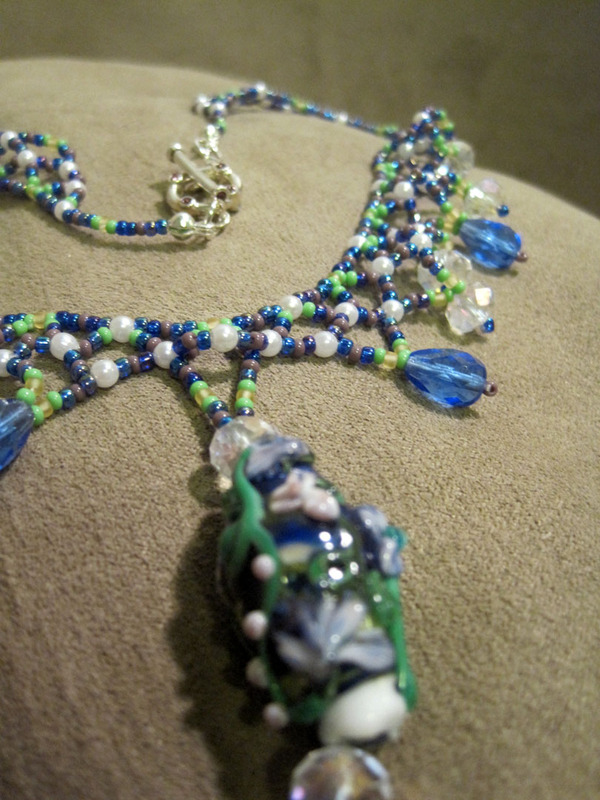 Your necklace with all that seed bead work is the perfect complement to that beautiful focal! Love all those colors. Hope you enjoy wearing it! Thanks for the sweet comments on my soup mix! This was fun! Have a great week! Beautiful bead work! I really like how you pulled out the soft pink color in the focal bead with beads from your own collection - they compliment it perfectly! I love how your necklace turned out, great work. Beautiful bead work. It brings out the colors so well! The seed bead work you did is wonderful. I think you captured the colors of the focal bead really well. Turned out very nice. What great bead weaving in that design. That is a lot of fun and the focal bead is very nice. It's so nice to hear how much everyone in this Bead Hop loved what they were doing. Those of you who do bead work take my breath away. Beautiful! Love the delicate laciness of this necklace. Your color choices were perfect for the focal! Wow, you matched the seed bead netting to the focal perfectly! It looks great! Wow! Beautifully done. I would have never considered beadweaving with that focal, but you executed so very well! Really a smart idea! Lovely. Alot of work went into this fabulous piece, Shiraz... great job! Beautiful beadwork and very pretty colors! Very pretty! You used the color palette in the focal well. Nice job. Oh My goodness. That is fantastic. People who can work with the little beads are amazing. I can't work with those little things..... they don't like me. :) This is a beautiful soup and you made a gorgeous piece. lovely netted necklace. a nice complement to the focal. lovely netted necklace--it complements the focal well. Beautiful... the texture of the bead weaving is wonderful, love it. Very pretty and feminine. Great job! Lovely work! You really did capture the feeling of the focal and showcased it nicely! Oh so totally gorgeous! Love the netting, love the colors you picked to go with the focal and LOVE the design! A very delicate pattern in a strong colour. I like it!